Located in south of Mumbai on western railway route with nearest railway station being Charni Road, Girgaum is one of the oldest location at Charni Road (East Side of Railway Station) and so is the chaowpatty beach named and known for. Its a small beach which is now one of the only open space sea side hangout location known for its Chaat Corners (Fast Food Eateries) like Bhel Puri, Pani Puri, Chana Masala, Pulav, Pav Bhaji, Baraf Gola (Ice Candies), Ice Creams and more. This is a dry white sand beach loved by kids ro build sand castles and jump around. Since one of the major tourist attractions and highly frequented beach, Cleanliness is still a big question to be dealing with. Girgaum beach is one of the top listed beaches in Mumbai and so is the regular clean-ups, Still we Mumbaikar’s and other visitors need to be more educated and should be taking public littering more seriously, and so are the unclean litters like chips packet, plastics etc. 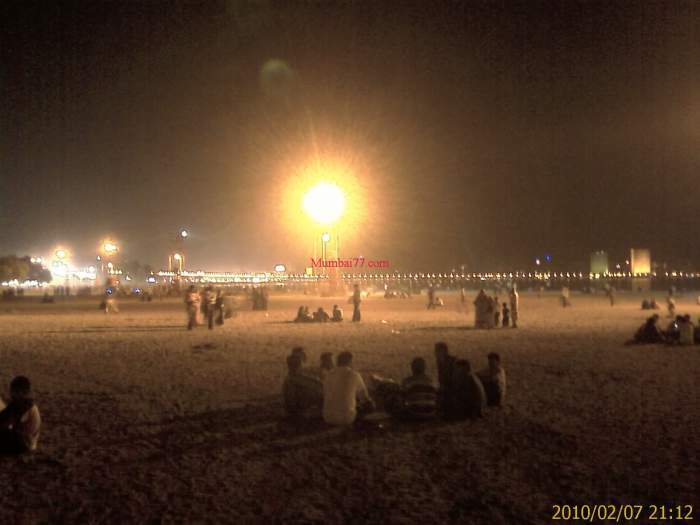 Champi & Tel Malish (Open Air Beach Massage) is another attraction of Girgaum chowpatty. Lay down on the provided spreadsheet and enjoy the local oil and body massage (No Naked) and enjoy cool breeze in evening. These spreadsheets are locally called ‘Chatai’ (Costing Rs.10 to Rs.15 per hour) and so is the vendor called ‘Chataiwala’. Almost every other seller is added with the word ‘Wala’ like Tea is called ‘Chai’ and the vendor is called ‘Chaiwala’ in local Hindi language. More such sellers seen on the beach are candy floss, tea, ice creams, balloons and few kids games. Evening is the real good feel at this beach. Since this beach is connect to Nariman Point promenade, the semi circular view of about 4 km (Called Queens Necklace) is very beautiful. On the right side of this beach are the huge billboards on the classy residential of Malabar Hills skylines which also has couple of famous attractions as detailed in Places to see around section. Very few big trees on the beach for shade during afternoon, These beach attracts huge crowd during weekends late evening only. Ideally during day time, few friends groups and couples are seen roaming around. To give company, few stray dogs who are old residents of this beach are always around. Immersion of Lord Ganesh Idol at Girgaum Beach is one of the biggest attraction of the season (Usually around End of June), Millions of people flock together to this beach with more than hundreds of Ganesh idols made of clay which are as huge as 10 to 15 feet. 10th day of Ganesh festival is what makes this beach more famous around the world. Under tight security, Mumbai police in uniform and civil keep eye on millions via CCTV and other techniques. Beach watch towers are specially made, Restrictions and road diversions are on place, Helicopters keep watch inside the sea for emergency purpose. Its is one of the very biggest attractions of Mumbai’s famous Girgaum beach. Keep a note that people refer Chowpatty beach to Andheri’s Juhu Beach also, So do not get confused this beach with the Subarban one which is also equally famous in city. Like every other beaches in Mumbai, This beach also offer a beautiful Sunset view with a scenic view ideal for taking couple of selfies and record few videos for memories. Practically, This beach is located at centre of main city and so there are many other places to see and visit which may take couple of days too. But here i will recommend the nearest places around the beach which your can cover up in a day tour. You must start with Taraporewala Aquarium which is located exactly opposite Girgaum beach, Just couple of year back this has been renovated and is worth visiting once. A very old and famous Lord Shiva Temple named ‘Babulnath’ is adjacent to the beach which still has the same old ancient looks. As already detailed, On the left is Nariman point which is connected to this beach at a prominade frontage of 4 Km, Great place to walk around in Monsoon, especially during High tides days (See this video). On the right is the famous Malabar Hills which can be seen from this beach and couple of famous attractions and heritage places are Sacred Banganga Water Tank, Hanging Garden & Kamla Nehru Park (Adjacent to each other). Opposite this beach (West side coastal area) is railway station and Towards east, Once you cross the railway station premise are major famous markets of Mumbai. Adjacent railway stations parallel to the coastal we talking about are Grant Road, Marine Lines and Churchgate in these 4 Km radius and each has its own speciality. As said, Nearest railway station to reach this beach is Charni Road on western railway route of local trains (3rd station from Churchgate). Adjacent to the station is this beach. If you are at any other locations in South Mumbai, Simple take a taxi and reach this beach. Parking is a major challenge, Yet not to worry as you will get some place around. Wash rooms are available at entry of this beach. If you are coming by road from Mumbai suburban and beyond, Simple take Bandra Worli Sea Link and take right once crossed. Keep going straight and you will see the famous Haji Ali Dargah, Mahalaxmi Temple. Once around Take ‘Bhulabhai Desai Road’ or ‘Pedder Road’ to reach this beach. Apps & Maps are handy best options although.